22. Keisuke Ikawa and Kaoru Sugimura. AIP1 and cofilin ensure a resistance to tissue tension and promote directional cell rearrangement. 21. Masaki Arata, Kaoru Sugimura, and Tadashi Uemura. Difference in Dachsous levels between migrating cells coordinates the direction of collective cell migration. 20. Shuji Ishihara, Philippe Marcq, and Kaoru Sugimura. 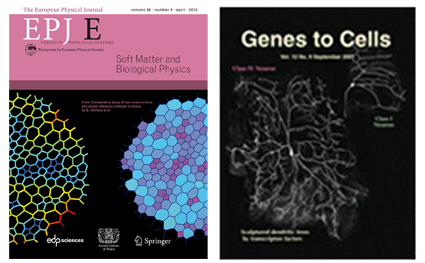 From cells to tissue: A continuum model of epithelial mechanics. 19. Yukitaka Ishimoto and Kaoru Sugimura. A mechanical model for diversified insect wing margin shapes. 18. Boris Guirao, Stéphane Rigaud, Floris Bosveld, Anaïs Bailles, Jesús López-Gay, Shuji Ishihara, Kaoru Sugimura, François Graner, and Yohanns Bellaïche. Unified quantitative characterization of epithelial tissue development. 17. Mihoko Kajita, Kaoru Sugimura, Atsuko Ohoka, Jemima Burden, Hitomi Suganuma, Masaya Ikegawa, Takashi Shimada, Tetsuya Kitamura, Masanobu Shindoh, Susumu Ishikawa, Sayaka Yamamoto, Sayaka Saitoh, Yuta Yako, Ryosuke Takahashi, Takaharu Okajima, Junichi Kikuta, Yumiko Maijima, Masaru Ishii, Masazumi Tada, and Yasuyuki Fujita. Filamin acts as a key regulator in epithelial defence against transformed cells. 16. Kaoru Sugimura and Shuji Ishihara. The mechanical anisotropy in a tissue promotes ordering in hexagonal cell packing. 15. Kaoru Sugimura, Yohanns Bellaïche, François Graner, Philippe Marcq, and Shuji Ishihara. Robustness of force and stress inference in an epithelial tissue. 14. Shuji Ishihara, Kaoru Sugimura, Simon J Cox, Isabelle Bonnet, Yohanns Bellaïche, and François Graner. Comparative study of non-invasive force and stress inference in tissue. 13. Hiroko Sano, Prabhat S. Kunwar, Andrew D. Renault, Vitor Barbosa, Ivan B.N. Clark, Shuji Ishihara, Kaoru Sugimura, and Ruth Lehmann. The Drosophila actin regulator ENABLED regulates cell shape and orientation during gonad morphogenesis. 12. Shuji Ishihara and Kaoru Sugimura. Bayesian inference of force dynamics during morphogenesis. 11. Shizue Ohsawa, Kaoru Sugimura, Kyoko Takino, and Tatsushi Igaki. Imaging cell competition in Drosophila imaginal discs. 10. Yuichiro Nakajima, Erina Kuranaga, Kaoru Sugimura, Atsushi Miyawaki, and Masayuki Miura. Non-autonomous apoptosis is triggered by local cell cycle progression during epithelial replacement in Drosophila. Fucci stocks are available from DGRC (#109676, #109677, #109678, and #109679). 9. Shizue Ohsawa, Kaoru Sugimura, Kyoko Takino, Tian Xu, Atsushi Miyawaki, and Tatsushi Igaki. Elimination of oncogenic neighbors by JNK-mediated engulfment in Drosophila. 8. Daichi Sato, Kaoru Sugimura, Daisuke Satoh, and Tadashi Uemura. Crossveinless-c, the Drosophila homolog of tumor suppressor DLC1, regulates directional elongation of dendritic branches via down-regulating Rho1 activity. 7. Kohei Shimono*, Kaoru Sugimura*#, Mineko Kengaku, Tadashi Uemura, and Atsushi Mochizuki#. Computational modeling of dendritic tiling by diffusible extracellular suppressor. 6. Kohei Shimono, Azusa Fujimoto, Taiichi Tsuyama, Misato Yamamoto-Kochi, Motohiko Sato, Yukako Hattori, Kaoru Sugimura, Tadao Usui, Ken-ichi Kimura, and Tadashi Uemura. Multidendritic sensory neurons in the adult Drosophila abdomen: origins, dendritic morphology, and segment- and age-dependent programmed cell death. 5. Kaoru Sugimura#, Kohei Shimono, Tadashi Uemura, and Atsushi Mochizuki#. Self-organizing mechanism for development of space-filling neuronal dendrites. 4. Yukako Hattori*, Kaoru Sugimura*, and Tadashi Uemura. Selective expression of Knot/Collier, a transcriptional regulator of the EBF/Olf-1 family, endows the Drosophila sensory system with neuronal class-specific elaborated dendritic patterns. 3. Kaoru Sugimura, Daisuke Satoh, Patricia Estes, Stephen Crews, and Tadashi Uemura. Development of morphological diversity of dendrites in Drosophila by the BTB-zinc finger protein Abrupt. 2. Arul Subramanian, Andreas Prokop, Misato Yamamoto, Kaoru Sugimura, Tadashi Uemura, Joerg Betschinger, Juergen A Knoblich, and Talia Volk. Shortstop recruits EB1/APC1 and promotes microtubule assembly at the muscle-tendon junction. 1. Kaoru Sugimura, Misato Yamamoto, Ryusuke Niwa, Daisuke Satoh, Satoshi Goto, Misako Taniguchi, Shigeo Hayashi, and Tadashi Uemura. Distinct developmental modes and lesion-induced reactions of dendrites of two classes of Drosophila sensory neurons. 2. Kaoru Sugimura, Pierre-François Lenne, François Graner. Measuring forces and stresses in situ in living tissues. 1. Tadashi Uemura, and Kaoru Sugimura. Yoshiki Hotta's Challenge from 2004 onwards. 6. 石原　秀至, 杉村　薫. 5. 杉村　薫, 石原　秀至. 4. 杉村　薫, 石原　秀至. 3. 石原　秀至, 杉村　薫. 2. 石原　秀至, 杉村　薫. A practical guide of theoretical biology for molecular biologists. 1. 杉村　薫, 木村　宏史, 上村　匡. Cellular and molecular mechanisms to achieve diversity of dendritic patterns. 2. 杉村　薫, 石原　秀至. 1. 石原　秀至, 杉村　薫.